I am not much of a collector - in fact, my wife is the 'pack rodent' in the family! However, I do have a very small collection of bus driver's uniform patches (actually, only Green Line and Triboro because they have special meaning to me). I am now proud to say that I have added Reading Bus Company to my fleet (as seen in the attachment). Reading has a double meaning for me personally; Green Line and Triboro sold off a number of Old Looks to the Pennsylvania operator, and my very rich great uncle Max Luria of Luria Brothers Steel Corporation had a 'marble mansion' in that city. The house was so big that the U.S. Navy commandeered it during WWII to use as a rehabilitation center. I remember as a kid going there with my parents and invariably getting lost in its catacombs. Max made his money in scrap metal and was probably responsible for slicing up more street cars and old look buses than any other dealer in the country. And, he was so mean that when he died people came to his funeral just to make sure he was dead! I believe it has since become the Berks Area Regional Transit Authority, serving Reading, PA and surrounding communities. I have some old schedules of theirs in my files. I believe the main transfer area is or was in the vicinity of the Reading Company's Franklin Street Station, for most routes. In a factory photo taken in Allentown, Pennsylvania we see fleet number 804 - a 1939 Mack Model CT-4D (Diesel) and one of two delivered to Reading Coach Company of Reading, Pennsylvania in October of that year. According to my pre-war Mack production records Reading's # 804 and its sibling (# unknown) were two of among only 21 of 574 CT's built with Diesel power plants between 1935 and 1941. Of note are the mechanical ventilation system (as noted by the intakes to either side of the destination sign, the very unusual 'external' windshield wiper transmissions (certainly much easier to service), rare (for the time) Michigan Markers above the destination sign and what appears to be an auxiliary destination sign below the right windshield. The gasoline versions of the CT of which Green Bus Lines (NY) had 100 were notoriously underpowered but I suppose Diesel plants would have changed all that. The bus is signed for Penn Avenue in the Reading suburb of West Lawn. Photo by Mack and courtesy of the Motor Bus Society. Penn Ave. was (and I believe still is) the western portion of the "Penn-Perk" line. The eastern end was Perkiomen Ave. They are both Rt. 422. 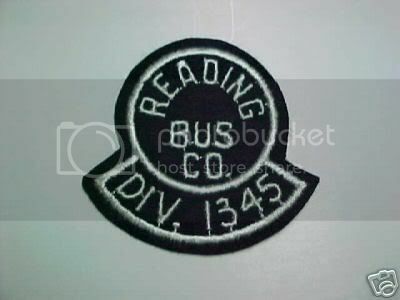 When I drove in the 60's, buses on this line ran through the City of Reading at about 20 minute intervals, although they had several different destinations outside of the city. The Berkshire Knitting Mills were still in operation at that time, and some of the Penn Ave. buses just went as far as the mills in West Reading. The furthest end of the line at that time was Sinking Springs, about 5 miles west of the city. The other destination was West Lawn, about halfway to Sinking Springs. The Perikomen Ave. side of the line had destinations of Stony Creek Mills, Pennside and Reiffton. Reiffton was about 5 miles east of the city. I'm not sure about present day, but from the days of horse drawn trolleys up until recently, the main transfer point was the bus stops at 4th and Penn Sts, 5th and Penn Sts. on Penn Street and the bus stops on 5th Street on either side of Penn. Up till the time that BARTA took over, there had been a dispatcher's booth on the northwest corner of 5th and Penn. Capital Trailways used the Reading Railroad station at 7th and Chestnut Sts. as a terminal up to some time in the 70's when Carl Bieber Bus opened a terminal on 3rd Street, and Trailways started using that facility. Carl Bieber Tourways recently bought Capital Trailways of Harrisburg and now operates those lines as Bieber Trailways. Note to Mr "L". Yes, I was a member of div. 1345 and I wish I would have kept my uniforms! Captured by an astute photographer sometime in the late forties on the streets of Reading, Pennsylvania is fleet number 719 - a 1946 GM Model TDH 4008 and one of twenty numbered 718 through 737 operating for the Reading Bus Company. 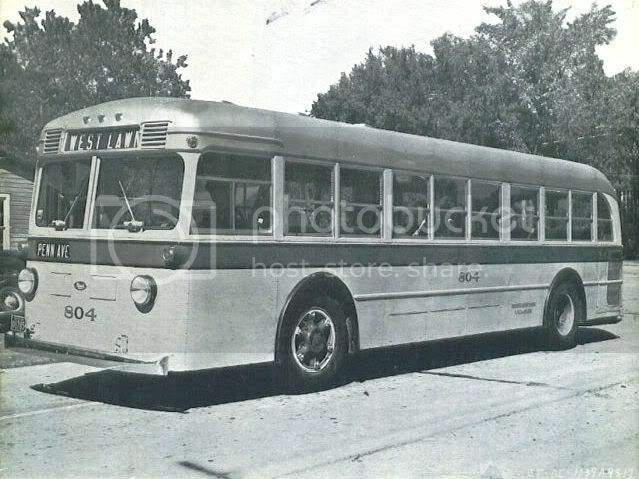 These buses were preceded earlier in 1946 with an order for fifteen Model TD 4007's numbered 703 through 717 which gave the company a total of thirty-five of the 40 passenger class to service their medium volume routes. With operators becoming more interested in either a smaller 36 or a larger 45 seat capacity, GM's production of the 40's ended in 1950 with the TDH 4010. Thanks again for your generous photo sharing Mr. L.
BARTA which started out as Berks Area Reading Transportation Authority has become Berks Area Regional Transportation Authority from what I understand. I believe due to the City of Reading not being able to hold up it's part of the deal and turning its part of the control to the County. The Bus transfer operations have moved form the 5th and Penn ports to a building between 7th Street (RR tracks) and 8th & Cherry and Franklin Streets behind the "Civic/Sports Center" at 7th & Penn. Although I think all the routes still pass through 5th & Penn. There is a photo of one of the newer BARTA buses in that building I believe in the member intro section where I made my clutsy debut. Maintenance work remains on Exeter Street, originally the Trolley Barn location. The Intra-city bus terminal remains at 3rd and Penn where Bieber now operates out of having taken over the Philly/Harrisburg/Pottsville Capitol runs. Rumor has it those operations will move back to the Franklin Street Station once that facility is restored by BARTA. I'll beleve it when I see it. I should have photos in my gallery on the Bieber buses at 3rd & Penn. Nice photo Mr. L. I'm sure that is more recent than the 40's. The 719 was well worn in that picture. The destination on the curtain is Kenhorst-Grill. That was a trolly line up till 1948. Also, the square piece of metal on the front was part of an ad campaign that I think ran in the late 50's. It originally had a soda bottle cap mounted on it. I drove that bus many times. The 700 series served up until a year or two before BARTA. You can see the 703 and 718 in your photo of the arrival of the Green Line buses in Reading. I believe that is about the time the "early" 700's were being pulled out of service. Rob, the name is good old fashioned Berks County politics. When the authority was formed, it was proposed that the name would be the Reading Transportation Authority. The County commisioners freaked out! With the amount of money we're contributing we want our name on it too! 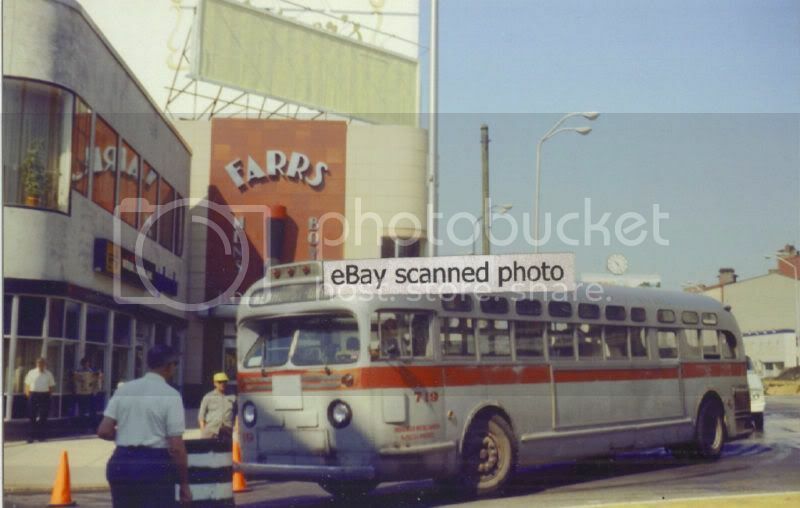 You are correct that it started as "Berks Area Reading Transportation Authority", although I believe the name was only changed to make it less clumsy. BTW Rob, did you notice that Bieber is running some new mini-buses on some of the line runs. I haven't had a chance to see what they are yet, but if I can catch one for a photo I'll post it. I agree with the early 70's. The clues I am going with is the National Central Bank on the corner. That was in between Hamilton Bank and I think the Bank of PA. (era wise) I have to check some of my other books, also it looks like a fairly modern Ford van coming up behind it. Green Spot soda cap on the front. Check Mr. L's photo of the 675 pulling into the Exeter Streeet Barn in an earlier post on here. Geen Spot was my childhood favorite back in the 60's, but every now and then I can still grab one. Reading vs. Regional - Chitty City seems to be selling everything to the county - parks, lakes, airports. If the Sheriff has his way, the "County Police" will take that task over too. (not sure there is anything wrong with that idea) Nothing surprises me anymore. On those Bieber mini rigs. See my photo gallary on here for two photos of #589. I had the bumpy pleasure of riding it twice in April. I recall it had an International truck grille on it. I also believe I have seen some sort of a "Limo" looking thing from Bieber around town. I am currently chasing #514 and a couple others for the Bieber "Philly Express" paint job. Every time I see them, we are going the opposite direction at speed. I also just posted some photos of BARTA rigs from B.C.S.D. Deputy Kyle Pagerly's funeral today. Look for that Green Spot ad on the second page of my introduction "newbie on board" under the new member introductions and for more of Mr. Linsky's photos he was so kind to share. We should transfer all the to the Reading gallery, some of them are there. And Jimmy, what was the deal on the Budwieser bus and the Emergency Management Fishbowl that sat out at Exeter Street in the early 80's? Photos in the Reading Bus Co Gallery too. That is it I am done for the night ......... long day! 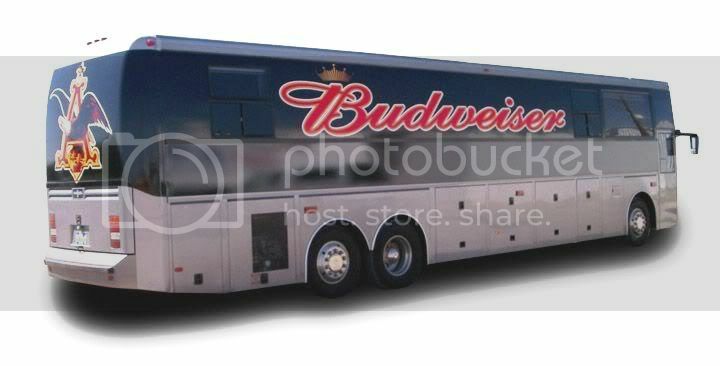 Budweiser did indeed pay for the bus wraps and is still doing so as can be seen on the late model cruiser below. Pepsi was also big on bus ads and, at one time, had giant metal bottle tops attached under the windshields of thousands of buses across the country. Photo courtesy of 'Signs On The Go'. I'm not really sure what the story was on the Bud bus. It was more or less some sort of publicity stunt rather than just advertising. I don't believe the bus actually ran in regular service. The fishbowl was being converted as a mobile command post. I don't know if it was ever used. I never saw it anywhere but along the fence either. That was an early fishbowl that was part of a small fleet BARTA obtained as part of a government program to see if they could be updated and sold to other Authorities. I don't know how many used buses they got, but the program was a flop. Funny thing is that years later I started driving for County of Lebanon Transit, and two of our buses at that time were 4517's from that bunch and were unrestored except for the COLT paint job. They even still had no smoking signs on the bus, signed by Tidewater Transit in Virginia. Thanks for reminding me that the bottle caps were Green Spot. I couldn't remember what company it was. Do you remember the Ford convertibles painted on the back of some of the old look buses, with the bus tail lights converted to Ford lights. They never changed the tail lights back after the Ford advertising campaign was over. Some of them went to the scrap yard still wearing Ford lights. Is there a chance that it happened to be used in a 'Bud' commercial? While Greyhound had GM custom-build Elvis Presley's personal Scenicruiser at the factory, they also custom-outfitted 15 other PD 4501's for special lease service. Ten were destined to operate as Los Angeles to Las Vegas Gambling Excursion buses which were outfitted with a full crew quarters and food preparation galley on the entry level with the upper deck as a rolling casino capable of handling about 25 VIP passengers, and the air-ride suspension over the tandem rear axles actually provided an adequately stable environment for the roulette wheels. One of those factory-built casino coaches (re-dubbed 'Stray Hound') currently belongs to the owner of the "Broken-Spoke Saloon" in Sturgis, South Dakota. I believe that one of the additional five buses may have originally been leased to Anhheuser Busch as an office coach and still exists in the hands of a gentlemen by the name of Kenny Plouff. Would love to see a photo of the AB job!